In the previous pAsuram, periyAzhwAr did mangaLAsAsanam for emperumAn’s thirumEni (divine form) and his kalyANa guNams (auspicious qualities). In this pAsuram, mangaLAsAsanam is done for emperumAn being with ubhayavibhUthi (wealth of both spiritual and material realms). *அடியோமோடும் நின்னோடும் பிரிவின்றி ஆயிரம் பல்லாண்டு! வடிவாய் நின் வல மார்பினில் வாழ்கின்ற மங்கையும் பல்லாண்டு! வடிவார் சோதி வலத்துறையும் சுடராழியும் பல்லாண்டு! படைப்போர் புக்கு முழங்கும் அப் பாஞ்சசன்னியமும் பல்லாண்டே. adiyOmOdum – with this servant – One question might arise, why is AzhwAr doing mangalAsAsanam for his own eternal existence? This is because, no one can seek out for the well-being of emperumAn like AzhwAr can do. Hence, AzhwAr is asking that he should be present always so that he can do mangaLAsAsanam. Why did he not say “ennOdum” (with me)? This is because AzhwAr is absolutely clear about his svarUpam (true nature) as a servant of emperumAn. Why did he say “adiyOmOdum” in plural instead of “adiyEnOdum” in singular? He is not satisfied by doing mangaLAsAsanam individually and since everyone is a servant of emperumAn (whether they know/accept it or not) he includes everyone in his gOshti (group) to perform mangaLAsAsanam for emperumAn. 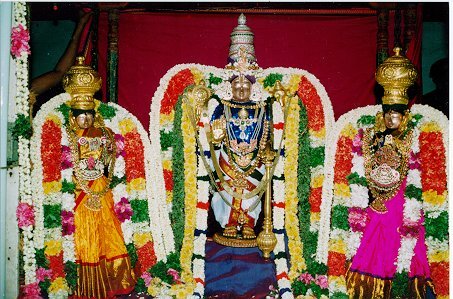 vadivAy nin valamArbinil vAzhginRa mangai – sAsthram declares “sradhdhayA dhevO dhEvathvam asnuthE” – By being with srI mahAlakshmI, emperumAn becomes dhEva (worshippable – supreme). Would it minimize emperumAn’s greatness by saying this? Not at all. By saying a gem is great due to its radiance, or flower is great due to its fragrance, the glories of gem/flower is not minimized – its only increased for having such radiance/fragrance. Similarly, bhagavAn being the master of srI mahAlakshmi, if she bring more glories, it only adds to the greatness of bhagavAn. mangaiyum – She is glorified as yuvthischa kumAriNI and he is glorified as yuvA kumAra: both of which mean “youthful adolescence”. 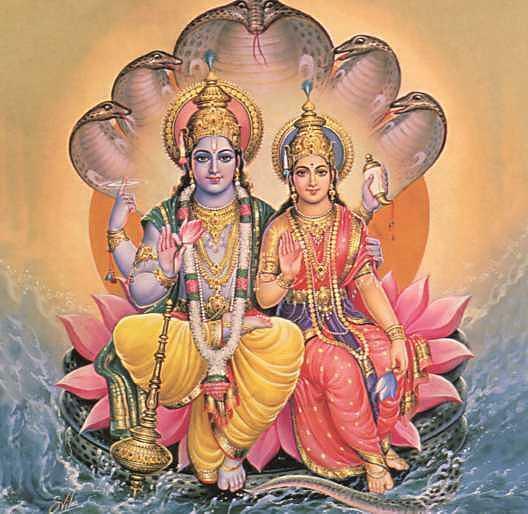 They have ever-youthful and matching divine forms. ap-pAnjasanniyamum – AzhwAr is saying as if emperumAn is not in front of him (“ap” word is used when denoting something which is not in front of us, similar to “that” in English). This is similar to mothers shying away from seeing their children fearing of jinxing (spoiling) their well-being. In this pAsuram, AzhwAr has included himself and other chEthanas who are part of leelA vibhUthi and periya pirAttiyAr, thiruvAzhi AzhwAn (disc), thiruchchangAzhwAn (conch) who are in nithya vibhUthi (paramapadham). Hence, this pAsuram is mangaLAsAsanam for emperumAn who has both nithya vibhUthi (spiritual realm) and leelA vibhUthi (material realm). The first 2 pAsurams reveal the meanings of thirumanthram. praNavam is explained by “adiyOmOdum” in this pAsuram. “pallANdu” in the previous pAsuram explains “nama:”. In the previous pAsuram “mallANda thiN thOL maNivaNNA” and the second pAsuram explains “nArAyaNa“. 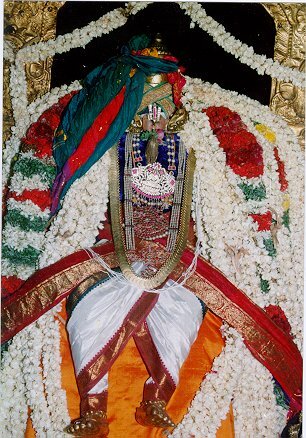 “un chevvadi chevvi thirukkAppu” explains kainkaryam which is requested by “Aya”. This entry was posted in mudhalAyiram, thiruppallANdu on June 8, 2015 by sutharsan srinivasan. periyAzhwAr on seeing bhagavAn with most beautiful form which reveals his auspicious qualities such as saundharyam (beauty), etc., in this world which is controlled by kAlam (time), out of great fear starts thinking “what bad might happen to him?” and performs mangaLAsAsanam (well-wishing thoughts) to emperumAn‘s divine and beautiful form to stay like that forever. In the first pAsuram, periyAzhwAr expresses let there be protection for all auspiciousness to bhagavAn’s reddish lotus feet for countless years. AzhwAr starts with human years and then moves on to dhEva’s (dhEvathAs – celestial beings) years and for one brahmA’s years and then countless bramhAs’ years! pallANdu – AzhwAr is saying ANdu (years) instead of days. The reason is that years denote one’s age/life-time. pallANdu (long live), jitham (let there be victory), nama: (I am for you, I surrender unto you), thORROm [thiruvAimozhi 2.1.7] (you have won), pORRi [thiruppAvai, etc] (long live) are all synonyms. pallANdu – AzhwAr is again saying owing to AzhwAr’s swarUpam (not stopping with once) and Iswara’s swarUpam (on seeing Iswara’s beauty, one cannot say this just once) as well. Also, just like a thirsty person will say “water, water” again and again until his thirst is quenched, AzhwAr will repeat “pallANdu” until his fear is eliminated. One big question arises here – it is normally seen that elders/superiors wish well and bless the younger/inferior ones. But when there is too much love and affection towards someone, even if they are superior to one, one could bless them for their well-being. On seeing that AzhwAr started fearing for Him and performing mangaLAsAsanam, perumAL thought of removing AzhwAr’s fear and showed his strength, similar to the rAmAyana incident. When sugrIva mahArAjar feared for perumAL and did not want to take vibIshaNAzhwAn, perumAL explained his strength and that removed mahArAjar’s fears. So, here, perumAL shows his strong shoulders using which he killed chANUra and mushtika in kamsa’s court. But this increased AzhwAr’s fears, similar to a mother who always worries for her brave son who could easily get into fight with others. AzhwAr started fearing that if dhEvathAs surrender to Him worrying about demons, He will go near the demons to win over – AzhwAr worries that going near such demons could harm perumAL. chevvadi – Contrasting/beautiful colors – divine blackish body and reddish lotus feet – Whenever a sEshabhUtha (servant) sees his sEshi (master), he always looks at the thiruvadigaL (lotus feet). This pAsuram is like a preface for the rest of the pAsurams.